Compact desk pad fits crowded work spaces and covers a 13 month date range (January – January) in one month per page format. Julian dates. Features 1 3/4" x 1 3/4" ruled daily blocks to help keep scheduling details neat. 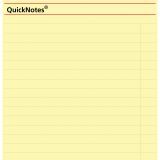 QuickNotes yellow highlighted writing area is the place where you can conveniently jot down to-do’s, meeting notes, contact info and more to stay perfectly organized. Each page features two past, current, and 10 months future reference calendars along the bottom. Federal holidays are highlighted in red. 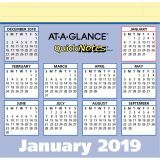 At-A-Glance QuickNotes Compact Monthly Desk Pad Calendar - Compact desk pad offers a special yellow QuickNotes area for note-taking and the perfect size for cubicle-size desks or crowded work spaces. Dated planning pages range 13 months from January to January. One-page-per-month format includes a QuickNotes writing section, ruled daily blocks (1-3/4 x 1-3/4"), Sunday-to-Saturday scheduling, shaded weekends, count of days/days remaining, federal holidays in red and one past, current and eight future months reference. The current reference month is highlighted with a red box for easy identification. 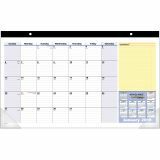 Calendar pages are perforated for clean tear-out and printed in blue, red and yellow ink on recycled paper. Desk pad also includes a thin black headband with eyelets for hanging and clear poly corners." Pages are perforated for clean, easy removal at the end of a month. Features a wide, black paper top binding with eyelets for hanging and clear corners to tuck pages in and keep them flat. 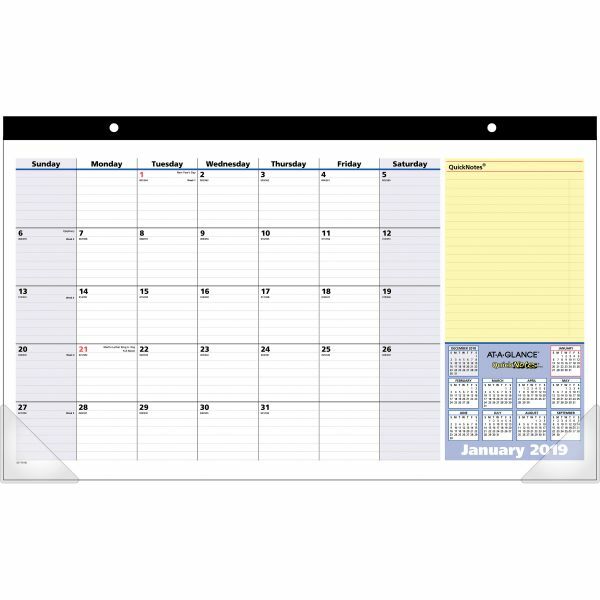 Desk pad calendar is a sturdy writing surface with durable backboard. Printed on quality paper containing 30% post-consumer waste. 17 3/4” x 10 7/8” page size. 17 3/4" x 11” x 5/32” overall size.